At least 16 different species of hummingbirds migrate into the United States each spring in order to build their nests and raise baby hummingbirds. Hummingbird nests are very small, about the size of a walnut shell, and very well hidden. When hummingbirds look for trees to build their nest, they typically look for certain criteria rather than species. Hummingbirds usually build their nests in a fork in the branch about 1 1/2 feet from the end of a thin branch. This ensures that predators won't be able to climb out to the nest. The branch may be anywhere from 3 to 60 feet off the ground. Nests are usually sheltered from rain and wind by leaves located a few inches above the nest. Hummingbirds do not like wind, so they prefer trees in clusters that provide more shelter than solitary trees. Temperature is also a major concern. In southern locations where temperature can get into the high 90s or even 100s, hummingbirds look for nests that will stay cooler. A hummingbird's eggs will "cook" if the temperature is above 97 degrees F for more than a few hours. In these cases, hummingbirds prefer broadleaf trees because they release more water, which cools the area. They often build the nest over a body of water, which cools the area even more. Favorite deciduous trees tend to be oaks, sycamores, maples, birch, poplar, elm and fruitless mulberry. In northern climates, heat poses a different problem. Hummingbirds look for spots where they can conserve heat, not prevent it. A hummingbird looks for a location that is sheltered by overhanging limbs, drooping branches or trunk deformities. 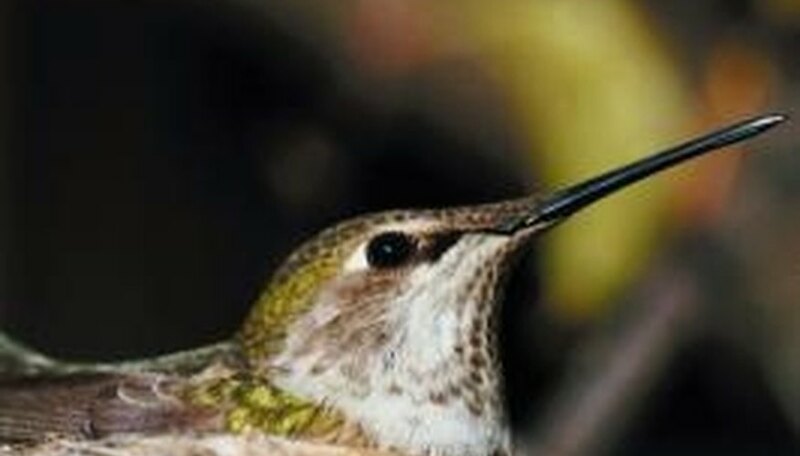 Conifers, willows, alders and cottonwoods are all trees that will help hummingbirds conserve heat, according to the Cornell Lab or Ornithology. Food is essential to a hummingbird's survival. The parents will not want to venture too far from the nest to eat or find food for their young. Hummingbirds have a high metabolism and must consume twice their body weight in nectar each day. They also eat insects, which provide them with protein. Trees where they can find both nectar and insects will be more attractive to hummingbirds, no matter what kind it is. A Bird's Home; Hummingbird Nesting; Dan True et al. Wild Birds Unlimited: How Do Hummingbirds Eat?